TWINS. 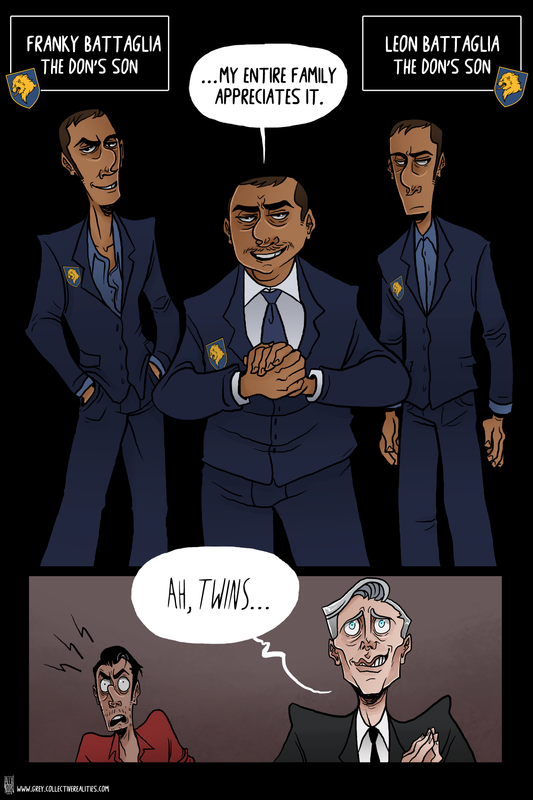 Yep, both Battaglia brothers have already been in the comic, they got you good hey? Watch as everyone scrambles back through the pages to see who was where. i am definitely going to go through all the pages to find the two!!! That is the greatest face Bobby has ever made. I feel like maybe the Don shouldn’t have revealed that to the The Boss and Bobby. Also, I am getting a real ominous feeling right now and it’s stressing me out. I identify with both Boss’ reaction and Bobby’s reaction. I feel bad I haven’t been keeping up better. But when I do I’m always floored. If they could like part their hair on different sides so we could tell them apart that’d be great…. But I think that would defeat their purpose.